Percutaneous pulmonary valve implantation (PPVI) was the first percutaneous intervention for the treatment of regurgitant lesions in humans. , The most common indication of pulmonary valve implantation is residual right ventricular outflow tract (RVOT) lesion after repair of congenital heart disease that can be stenotic, regurgitant, or mixed. The common congenital heart lesions falling in this group are pulmonary atresia, ventricular septal defect, Tetralogy of Fallot, absent pulmonary valve syndrome, common arterial trunk (Truncus arteriosus), Rastelli-type repair of transposition, ventricular septal defect with pulmonary stenosis or pulmonary atresia, and after Ross operation. Stenosis may result from the small size of conduit in a young patient and subsequent patient - prosthesis mismatch, residual narrowing due to angulation, kinking or torsion of the conduit, intimal proliferation, or degenerative calcification. Regurgitation may be due to degeneration of valve leaflets. This manuscript describes my experience with the Melody® valve (Medtronic Inc.) that is implanted using a custom-made delivery system (Ensemble® ) [Figure 1]. The device is a bovine jugular venous valve that is sutured inside a CP stent (NuMED Inc) and has been described in detail before. The basic principles, however, would apply for valvulation of the RVOT and are based on the experience of stenting obstructed RV to PA conduits. There is limited evidence in the literature to suggest clear indications for treatment of RVOT dysfunction. Treatment of stenosis has been successful for a longer duration; however, treatment of regurgitant lesions is fraught with difficulties and controversies due to limitations in longevity of treatment options. Surgical treatment of regurgitation was often delayed due to the need for open procedures, that were often reoperations, and the potential need for future operations particularly in young patients in the lifetime management of their congenital heart disease. For interventions on the RVOT, we decided on the following indications during the early experience of PPVI, and I believe in clinical practice, they are still useful - 1)Symptomatic patients with severe pulmonary regurgitation (PR) with RV dysfunction and/or dilatation, 2)Patients with symptomatic arrhythmias and severe PR with RV dysfunction/dilatation needing intervention, 3)Severe PR and evidence of RV dysfunction (on echo/MRI) and objective evidence of decreased exercise tolerance in asymptomatic patients, 4) Patients with moderate or severe PR and additional lesions (residual VSD, branch PA stenosis, and tricuspid regurgitation) needing intervention, with or without symptoms, 5) Asymptomatic patients with severe RVOT obstruction (RV pressures equal to or more than three-fourth systemic pressure) with our without PR, 6) Symptomatic patients with RVOT obstruction (RV pressure more than half of the systemic pressure) with or without PR. The recommendation from the scientific statement from AHA on indications for cardiac catheterization and intervention in pediatric cardiac disease for percutaneous pulmonary valve replacement. Once it is clear that the patient needs intervention for RVOT dysfunction, case selection for suitability of percutaneous intervention is important. Appropriate length to the conduit available well away from pulmonary artery bifurcation (Melody valve is mounted on a 34 mm 8 zig CP stent and that shortens by 13.5% (28.8 mm) at 18 mm balloon inflation, and by 26% (24.6 mm) at 22 mm balloon inflation). Risk of coronary compression by stent is ruled out. Early experience with bare metal stenting of RV to PA conduits also emphasized the importance of this risk factor. For patients where coronary arteries are reimplanted, such as Ross operation; although the native anatomy of coronary origins was normal, one must be mindful of the changed spatial orientation of coronaries in relation to the reconstructed RVOT that could create a risk of coronary compression. Active infection is an absolute contraindication for this procedure. Previous history of conduit endocarditis is a concern. Endocarditis within the conduit is under-diagnosed and may remain dormant despite negative blood cultures and inflammatory markers. Patients less than 20 kg pose a higher risk of complications, such as vascular injury or cardiac trauma. Pregnancy is an absolute contraindication due to the biological component of the device. A complete detailed history and clinical examination, backed up by investigations for structural and functional information is required for planning the procedure. In the early assessment, history should include details of all previous catheter interventions and operative notes. For example, a "homograft monocusp reconstruction" of RVOT sometimes over the years gets transcribed as "homograft reconstruction," creating a significantly different RVOT characteristics that may have important procedural implications. In patients with stented RVOT conduit, information about what balloons where used to what final diameter, gives some idea to choose delivery systems during PPVI. The surgical notes may comment on spatial relationship of the coronary arteries to great arteries or outflow tracts that may be more helpful than any imaging technique. For example, use of RV to PA conduit to repair Tetralogy of Fallot with anomalous LAD across the RVOT, would create a double barrel RVOT with the anomalous coronary artery "sandwiched" in between. This arrangement has a very high risk of coronary compression. Clinical history should include meticulous questioning to rule out subtle endocarditis. Examination should include oral examination to rule out dental caries or in fact a formal dental referral before the actual procedure. Detailed echocardiographic assessment helps in quantifying right ventricular hypertension, dilatation, and dysfunction, and rule out other right-sided lesions. Additional cross sectional imaging such as CT angiography or cardiac magnetic resonance (CMR) imaging, not only provides important information about the spatial relationship of the conduit to its surrounding structures,but also quantifies lesions such as pulmonary regurgitation, right ventricular dilatation and dysfunction, and branch pulmonary artery stenosis. Acquisition and interpretation of CT angiography or CMR should be done by an experienced cardiac radiologist. One should be aware of the fact that the dimensions of the RVOT measured in averaged volume data do not give a good idea of the changes in dimensions of the RVOT in systole and diastole. Knowing the maximum dimension, that may be in systole or diastole, is important. 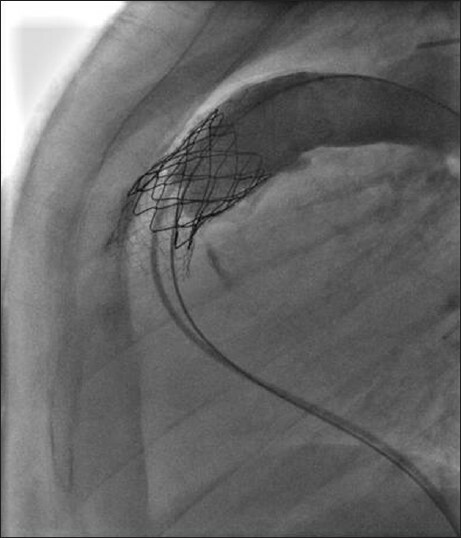 To judge the compliance of the RVOT in a borderline diameter reaching 22 mm can be very difficult. Spatial relationship of coronary arteries to the site of stent implantation is one of the most important factors in suspecting a risk of coronary compression. Although this can be seen best with CMR or CT, there are no clear guidelines as to what should be the minimum distance that would prevent coronary compression. Test balloon dilatation with selective coronary injection is a vital step to assess this risk as discussed subsequently. Before the procedure, blood investigations including full blood count and inflammatory markers such as CRP or ESR are important to rule out any active infection. Routine cross matching of blood is necessary as any event leading to bleeding is likely to be catastrophic or surgical. Vascular ultrasound helps in planning access. If femorals are blocked, internal jugular vein can be used. The general steps for the procedure are similar to the ones used for any interventional catheterization. I prefer to perform this procedure in a bi-plane catheterization lab. The procedure is performed under strict asepsis, with antibiotic cover. Strict operating room environment should be maintained. Under general anesthesia, vascular access is gained in the femoral artery and vein. I prefer to use ultrasound (SonoSite) to assess the integrity of vessels and to gain vascular access. Arterial access is not only important to assess hemodynamics, but also serves well for monitoring systemic arterial pressure during complex interventions and provides access for coronary angiography, one of the important steps before the valve implantations. I prefer to start with a venous sheath of either 7 or 8 French size. This provides a good lumen for a high-flow angiographic catheter. Right heart catheterization for haemodynamics is performed with Judkins Right (JR) 3.5 or any other catheter with a curved tip. To cross the tricuspid valve, a convex curve of a JR catheter with a right atrial loop to prevent the tip getting caught in chordae tendinae, usually works. In adults with severe dilatation of the right atrium and right ventricle, particularly with significant tricuspid regurgitation, crossing the tricuspid valve can be difficult. A posterior atrial loop and use of a guide wire to cross the tricuspid valve on the inferior wall of the right ventricle could be used to avoid getting caught in the chordae. Once the tricuspid valve is crossed, the RVOT is entered with either a balloon-tipped catheter or with a 0.035 in hydrophilic coated guide wire (Terumo) to get a good distal position in the right or left pulmonary artery. The catheter is then positioned preferably in the lower lobe pulmonary artery branch so that enough length of the stiff wire could be left in the pulmonary artery during manipulation of the long sheaths for bare-metal stenting and the subsequent valve implantation. Once a good distal position of the catheter is achieved, a stiff exchange wire is positioned through this catheter. There is a wide choice of stiff wires in the interventionalists' armamentarium. My first choice tends to be the Amplatz .035 inch Ultra-stiff 260 cm wire (Cook® ) To help manipulation of the sheath- guide wire system, I put a curve on the wire to match the curve of the catheter as it courses through the RVOT and branch PA. The curve works by acting like a hook allowing the sheath to be guided by pulling on the wire without losing its distal position. The shape of the curve could be judged from looking at the course of the catheter in the frontal and lateral projections. An experienced operator does this by good judgment, but operators who are less experienced could hold the curve of the wire over the patients' chest and do a quick fluroscopy to overlap it over the catheter course in the patient. A poorly designed curve, however, would prevent easy tracking of the sheath. One needs to know stiff wires very well to know the length and characteristics of the distal floppy part. The junction between these two segments of the guide wire, if kinked during manipulation, is a lethal weapon in the branch pulmonary arteries. Any kink in this part of the wire should be recognized early, and if possible, the guide wire should be changed. Kinks in any other part of the guide wire are a big nuisance for every single subsequent step, so it makes sense to change the wire rather than risk the consequences. Invariably, one regrets not having done this sooner. Other stiff wires that could be used are the back-up Meier wire (Boston Scientific) or the Lunderqvuist (Cook) wire. Once the guide wire is in place, I use a Multitrack™ angiographic catheter (NuMED Inc) over the stiff wire to obtain haemodynamic data, assess gradients on pull-back and perform angiography. The Multitrack catheter is versatile to perform all the above mentioned functions over the stiff guide wire. The manipulation of this catheter has a learning curve, and one needs to be careful to prevent kinking at the junction of the over-the- wire distal portion to the shaft or body of the catheter. 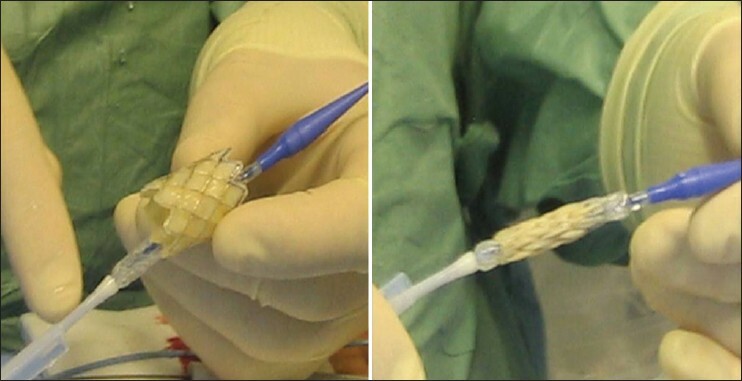 The stiff end of a Terumo wire may be used to provide support to the Multitrack catheter to provide strength while crossing tight or tortuous RVOT. A proximal loop in the RA may also facilitate this provided the distal shaft of the Multitrack has its axis parallel to the guide wire axis (this principle should be followed at all times whilst manipulating a Multitrack catheter). 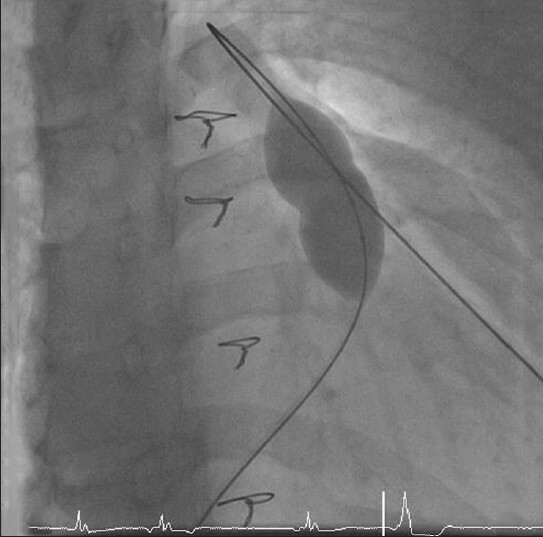 The stiff wire should be kept free from the inner curvature of the right heart and within the lumen of the vessel (for example, branch pulmonary artery in this case) while advancing the Multitrack catheter, by gentle traction on the guide wire. The wire should be held within the lumen of the vessel before contrast injection using a power injector to prevent dissection of the vessel wall and intramural contrast injection. Angiography is performed in the RVOT, also assess branch PA anatomy to rule out any distal obstruction if MRI or CT not done to assess bifurcation and PA anatomy. The projections used for the right heart should be decided based on the RVOT morphology. Lateral with caudal tilt (10-20), RAO to open up length of stenosis and for PA bifurcation, a four chamber projection for PA bifurcation (LAO/Cranial 60/40) with some modifications are useful. Once the RVOT angiogram is performed, I prefer to perform aortic root angiogram with the Multitrack catheter in the RVOT. I prefer to do this in frontal and lateral projections, if any angled projections are used, they should as far as possible, be perpendicular planes to each other. If in any projection, a coronary artery that appears further away from the RVOT is likely to be the true relationship, based on the principles of parallax. If there is reimplantation of coronary arteries with placement of a conduit to repair valvular disease, one cannot assume the coronary arteries to be "safely" away from the RVOT. Even after a Ross operation, the reimplanted coronary arteries and the orientation of the RV to PA conduit could create a potential risk of coronary compression. The coronary artery anatomy and its relationship to the conduit is one of the most important consideration for the success of the procedure. To my knowledge, there are no late reports of events related to coronary compression after pulmonary valve implantation. Whether a stenotic conduit is dilatable to an effective diameter to achieve minimal residual gradient. Whether a dilated conduit can safely "hold" the valve without embolization. In patients with no significant stenosis, a sizing balloon (such as PTS sizing balloon NuMED Inc) could be used in the RVOT to assess the compliance and diameter of the RVOT. If the balloon inflates easily to a diameter of 22 mm or more at low pressure, the implanting zone is unlikely to hold a stent [Figure 3]. Stent fractures have been described in early experience of transcatheter intervention for conduit stenosis. We found an incidence of 21% in our early experience [Figure 4]. Absence of calcification, nonconduit outflow tracts and presence of recoil were factors that increased the risk. To reduce this risk, prestenting of the conduit with bare-metal stents before implanting the valve is now widely accepted and used routinely by our group and others around the world. The principle of prestenting is to reduce the compressive stress on the valve-stent with an intention of reducing the incidence of stent fracture. It also helps in successfully relieving severe stenosis particularly where significant recoil is seen after predilation. Depending on the severity of stenosis, the number of bare-metal stents may range from 1 to even 3 to 4. The risk of reducing luminal diameter with stainless steel stents is low, for the gain achieved with effective relief of stenosis. I prefer to use the EV3 Max LD stents. The length of the stent is determined by the length of stenosis. I have on occasions, used a CP stent (covered or uncovered); however, I have not used more than one of these before valve implantation. I perform the pre-stenting on BIB balloons with an intention of safe deployment, through a long Mullin's sheath. For EV3 stents, upsize the sheath by 1-2 French size over the recommended introducer for the BIB balloon, and for the covered CP stent, I upsize it by 2-3 French sizes. The stent implantation is performed in a standard fashion with all precautions and manouvres used for stent delivery in the RVOT or branch PAs, where basic principles of guide wire sheath manipulation are followed. In patients with difficult tortuous course of RVOT, such as extra-anatomical location of the conduit, a loop in the right atrium helps. This should be done in single smooth motion remembering to operate the sheath and guide wire together by the same operator. The same principle applies for undoing the loop, or else one risks the loss of guide wire position. The side arm of the sheath can be used to perform check angiography for stent positioning. Telescoping multiple stents may be necessary for long stenoses [Figure 5]. If branch PA stenting would be necessary, in patients with tight conduit stenosis, I prefer stenting the conduit before the branch PA's. Origin stenosis of the PA branches are not favorable lesions if the conduit stenosis is close to the bifurcation. In these situations, it is better to stent the conduit first otherwise there is a risk of rupture of the balloon in the delivery system of the valve against the edge of the distal stent. Once the bare metal stenting is achieved, one could choose to use a high-pressure balloon if there is a residual waist or gradient more than 25 mm Hg. High pressure Mullins balloon up to 10-12 atm, or long ultra -high-pressure balloons such as Atlas, have been used. Once the prestenting opens up the conduit, in principle, manouvering the delivery system of the valve should be easy. The choice of delivery system depends upon the size of the conduit. Generally, the delivery system selected should not have an outer diameter larger than the native conduit size. If a large- sized delivery system has to be used (22 mm delivery system for a 18 mm homograft), one should be mindful that the intention should be to achieve a diameter to deploy the valve in a stable position, rather than achieve a full inflation of the outer balloon. As the BIB balloons are not high pressure balloons, the risk of conduit rupture should be low. The Ensemble delivery system essentially has a BIB balloon catheter ranging from 18 to 22 mm outer balloon (4.5 cm length), is 100 cm long and has an outer sheath that covers the BIB balloon to reach the proximal end of the distal "carrot-shaped" dilator. This sheath has a maximum outer diameter of 22 French. The venous access site is dilated in a graded fashion with a 14 Fr and then a 22 Fr dilator to facilitate easy entry of the delivery system. Often, a small incision is necessary for easy passage through skin and subcutaneous tissue. The delivery system has lumens for inner balloon, outer balloon, guide wire lumen and the outer sheath. The outer sheath at its proximal end has a haemostatic valve. The side arm of the sheath provides a port for injecting contrast for angiography. The delivery system is flushed and balloons are prepped in standard fashion. The valve is washed in bowls of saline as per instructions provided by the manufacturer to remove any preservatives (two 1 min rinses in bowls of 500 mL saline). The valve is carefully inspected for the structure and function. We have never needed to discard a valve for structural defects. It is not uncommon to find asymmetrical leaflets to the valve, one being smaller. When tested with saline, there is a small leak of saline drops, due to the absence of the diastolic pressure that aids leaflet coaptation, and this should not be considered abnormal. The valve is crimped down on a 2 mL syringe loosely and carefully, to avoid any asymmetrical crimping. It is then loaded on to the balloons of the delivery system and crimped down further. The walls of the venous valve often crinkle and protrude through the cells of the stent making it thicker. The Melody valve has the venous valve sutured inside the stent as opposed to the covered CP stent that has the Goretex sutured to its outside. Once the stent is crimped securely, the outer sheath is brought over the valve taking care to include all the proximal struts of the stent. If the outer sheath is very tight as it goes over the Melody valve, it may have to be crimped more. The valve should be opened only as close to implantation as possible. As it contains biological material, it is absolutely important for the valve to be lying exposed for as short a time as possible. During the wash, remove the Multitrack and the introducer sheath; dilate the femoral vein with a 14 Fr and 22 Fr dilator to provide easy entry of the delivery system through the skin. Prepare the delivery system by flushing the guide wire lumen, and side arm of the outer shaft of the delivery system. The valve is then crimped down in a 2 mL syringe, by symmetrical squeezing and elongating action, until it loosely fits in the body of the syringe. One has to ensure correct orientation of the valve loading it on to the BIB balloon. Look at the "distal" label of the valve. Blue suture on the stent matches the blue dilator of the delivery system which is at distal end of the BIB balloon, white suture matches the white of the proximal end of the BIB balloon catheter. We made it part of our implantation protocol to have a part of the nonoperating team to check this and document this in the notes, as soon as it is done. To load the valve onto the BIB balloon of the delivery system, the outer sheath is pulled back. Maintain the position of the stent on the centre of the BIB using the markers at the end of balloons as a guide. The outer sheath then covers the stent-valve assembly, including all proximal struts of the stent. Side arm of the outer shaft flushed as it covers the BIB-valve-stent assembly and engages the proximal end of the dilator tip. The delivery system is now loaded and ready. The 22 Fr dilator is removed, a small incision could be made on the skin with a blade. The delivery system is advanced over the stiff guide wire and tracked to reach the RVOT in projections that are deemed most suitable for implantation. In patients with bare metal stents, the stents act as a good reference point to uncover the valve and angiography to check the stent position is not necessary. Manipulation of the delivery system over the stiff wire requires manipulation of both, to advance the system into tortuous and stenosed RVOTs. Standard rules of guide wire/balloon catheter/sheaths manipulation apply. For example, to facilitate advancement of the delivery system, pull on the guide wire without losing position of the distal end, pull the guide wire away from the wall of the RVOT, try to keep the guide wire in the centre of the lumen with the optimum tension. To position the stent more proximally, gentle forward pushing of the guide wire causes the delivery system to move back. Partial uncovering of the valve-stent assembly may help in advancing the delivery system, but this remains a risky manoeuvre and with prestenting of the conduit being routine, is hardly necessary. Avoid complete uncovering of the valve before reaching the site of implantation. the length of the stenosis in conduit is covered by the stent. Sternal wires, clips on shunts, ET tube, pigtail in aortic root could all be used as reference points as long as the table position is not changed and the projections are fixed to visualize the RVOT. Once the desired position is reached, uncover the valve by bringing back the outer shaft of the delivery system over the shaft of the balloon catheter up to the black double ring marker. The distal end of the outer sheath is not radio-opaque and uncovering would be seen only as change in the alignment of the valve-stent assembly. Always pull back on the shaft of the outer sheath and not on the side-arm. This manoeuvre may require considerable force depending on the angulation of the delivery system. Angiography can be performed from the side-arm of the outer sheath to reassess position, if necessary. 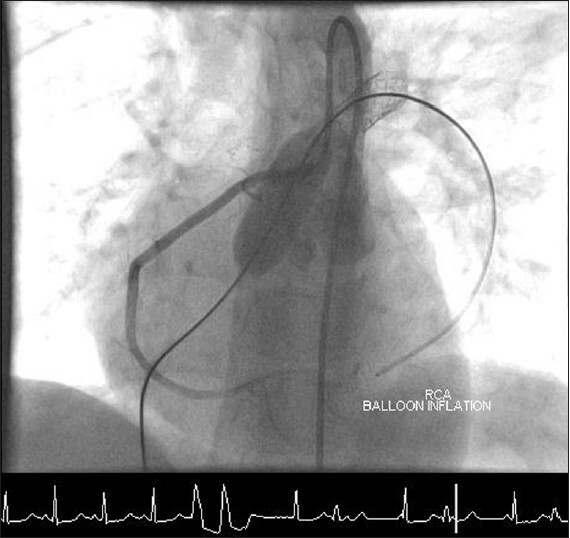 Once the valve is uncovered, the inner balloon is inflated and position confirmed, check angiography can be repeat if required. With inner balloon inflated, the second operator inflates the outer balloon to its full dimension to implant the valve stent assembly, till it apposes to the walls of the bare metal stents. Both balloons are then deflated. The delivery system is then removed avoiding any tension on the valve leaflets by holding the guide wire in the centre of the stent. Multitrack catheter is then advanced over the wire for hemodynamic and angiography. If acceptable, angiography performed above the valve to assess regurgitation. If residual gradient is more than 25 mm Hg, a high pressure balloon (e.g., Mullins balloon) of the same size as the outer diameter of the BIB advanced over the guide wire and inflated with and indeflator. If acceptable, any catheter or guide wire across the valve is removed under screening. Hemostasis and local anesthesia to the groin. The venous access site can be sutured with a figure of 8 stitch to achieve haemostasis. After the procedure, routine observations performed as indicated after an interventional catheterization. Risk of bleeding and hematomas may be high in patients with large French catheters or sheaths, and haemostasis should be meticulous. As there is a lot of manipulation within the heart and pulmonary vasculature with large sheaths, high pressure balloons and very stiff wires, one has to watch for perforations in pulmonary arteries, trauma to right heart structures or rupture of conduits. Any progressive hypotension should be a warning to look actively and to initiate measures to stabilize the patient. Pulmonary artery rupture or perforation could be controlled with temporary balloon inflation across the disruption to stop the bleeding until occlusive devices or covered stents could be used. Conduit rupture has always manifested as hemothorax rather than pericardial effusion. Opacification of the hemithorax on fluoroscopy is rapid and generally associated with hemodynamic compromise. Pleurocentesis and autotransfusion using filters can stabilize the patient until remedial measures could be executed. Generally, the bleeding stops, and surgical explanation is needed only in some patients. Although the Melody valve is a covered stent, the stent may not completely appose against the inner surface of a calcified homograft. Unless the proximal and distal ends are completely apposed and seal any potential "para-valvar space," there is risk of bleeding from a ruptured conduit. Bleeding may occur by tear in the distal main pulmonary artery beyond the conduit anastomosis. Embolization or migration of the valve may need surgical explantation. Potentially, the valve could be "parked" in the inferior vena cava, and stented to flatten the valve leaflets. However, the risk of injury to the RV and tricuspid valve is not worth taking and surgical removal is a more controlled approach. Coronary occlusion is the only cause of procedure related death, to my knowledge, associated with pulmonary valve implantation in the world wide experience [Figure 6]. Salvage procedures include surgical explanation of the conduit and therefore the valve inside it, to relieve external compression or coronary artery interventions with stenting. Due to the catastrophic consequences of compression, there is absolutely no justification to proceed with pulmonary valve implantation if there is any perceived risk of coronary compression and patient should be referred for surgical conduit replacement. Restenosis of the Melody valve may result from the stent fracture particularly when they are multiple and compromise the integrity of the valve. Identifying the stent fractures, is important and can be done by x-rays or CT. In-stent stenosis without stent fractures could be treated with high pressure balloon dilatation, but most often requires restenting with bare metal stenting and implantation of a second valve (valve-in-valve). This is now accepted treatment strategy in transcatheter valve implantation, and successful in prolonging the life of the implant. Endocarditis is a potential complication as with any implant and may be difficult to diagnose. In our initial experience, we treated patients with intravenous antibiotics with complete resolution of infection with some increase in valve regurgitation. My experience is limited to the use of Melody valve, reports using the Edwards-SAPIEN transcatheter heart valve (THV) with encouraging results have been described. Kenny reported the early results of a multicenter Phase-I trial, where 36 patients were catheterized with an intention to treat. The THV is made of bovine pericardial leaflets sutured to a stainless steel stent that is 14-16 mm long. Hence, prestenting is necessary to provide a landing zone and to relieve long stenosis. The delivery system is 22 or 24 Fr for 23 or 26 mm diameter valves that are suitable for larger conduits. The delivery system (Retroflex) consists of a 30 mm balloon catheter and a deflectable guiding catheter. Device success was reported in 86.1% (31 of 36) with good relief of gradient and amelioration of pulmonary regurgitation. Three patients had migration of the THV, needing surgery. There are some concerns about asymmetrical valve expansion and residual pulmonary regurgitation. The valve function at 6 months post implant is encouraging and long term follow-up is needed to assess sustained results. 1. Bonhoeffer P, Boudjemline Y, Saliba Z, Merckx J, Aggoun Y, Bonnet D, et al. Percutaneous replacement of pulmonary valve in a right-ventricle to pulmonary-artery prosthetic conduit with valve dysfunction. Lancet 2000;356:1403-5. 2. Khambadkone S, Coats L, Taylor A, Boudjemline Y, Derrick G, Tsang V, et al. Percutaneous pulmonary valve implantation in humans: experience in 59 consecutive cases. Circulation 2005;112:1189-97. 3. Feltes TF, Bacha E, Beekman RH 3rd, Cheatham JP, Feinstein JA, Gomes AS, et al. Indications for cardiac catheterization and intervention in pediatric cardiac disease: A scientific statement from the American Heart Association. Circulation 2011;123:2607-52. 4. Momenah TS, El Oakley R, Al Najashi K, Khoshhal S, Al Qethamy H, Bonhoeffer P. Extended application of percutaneous pulmonary valve implantation. J Am Coll Cardiol 2009;53:1859-63. 5. Daskalopoulos DA, Edwards WD, Driscoll DJ, Danielson GK, Puga FJ. Coronary artery compression with fatal myocardial ischemia. A rare complication of valved extracardiac conduits in children with congenital heart disease. J Thorac Cardiovasc Surg 1983;85:546-51. 6. Sridharan S, Coats L, Khambadkone S, Taylor AM, Bonhoeffer P. Images in cardiovascular medicine. Transcatheter right ventricular outflow tract intervention: the risk to the coronary circulation. Circulation 2006;113: e934-5. 7. Eicken A, Ewert P, Hager A, Peters B, Fratz S, Kuehne T, et al. Percutaneous pulmonary valve implantation: Two-centre experience with more than 100 patients. Eur Heart J 2011;32:1260-5. 8. Peng LF, McElhinney DB, Nugent AW, Powell AJ, Marshall AC, Bacha EA, et al. Endovscular stenting of obstructed right ventricle -to-pulmonary artery conduits: a 15-year experience. Circulation 2006;113;2598-605. 9. Nordmeyer J, Khambadkone S, Coats L, Schievano S, Lurz P, Parenzan G, et al. Risk stratification, systematic classification, and anticipatory management strategies for stent fracture after percutaneous pulmonary valve implantation. Circulation 2007;115:1329-7. 10. Nordmeyer J, Lurz P, Khambadkone S, Schievano S, Jones A, McElhinney DB, et al. Pre-stenting with a bare metal stent before percutaneous pulmomary valve implanation: Acute and 1-year outcomes. Heart 2011;97;118-23. 11. Nordmeyer J, Coats L, Lurz P, Lee TY, Derrick G, Rees P, et al. 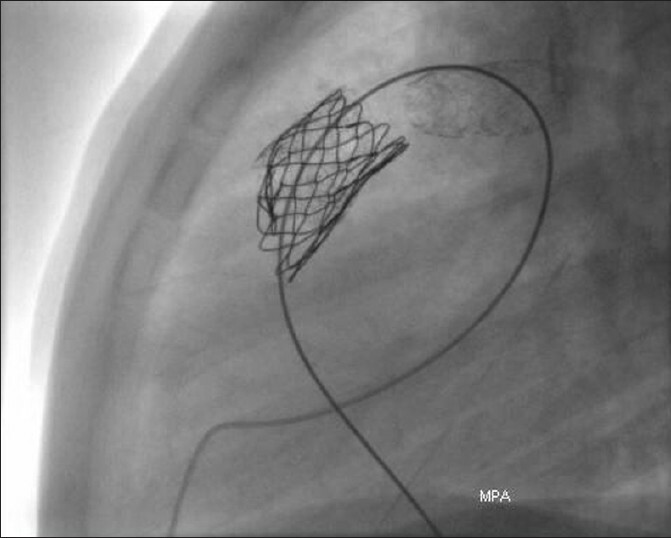 Percutaneous pulmonary valve-in-valve implanation: A successful treatment concept in early device failure. Eur Heart J 2008;29:810-5. 12. Lurz P, Coats L, Khambadkone S, Nordmeyer J, Boudjemline Y, Schievano S, et al. Percutaneous pulmonary valve implanation - Impact of evolving technology and learning curve on clinical outcome. Circulation 2008;117:1964-72. 13. Kenny D, Hijazi ZM, Kar S, Rhodes J, Mullen M, Makkar R, et al. Percutaneous implantation of the edwards SAPIEN transcatheter heart valve for conduit failure in the pulmonary position: Early Phase I results Form an International Multicenter Clinical Trial. J Am Coll Cardiol 2011;58:2248-56. 2 Doubly committed subarterial ventricular septal defect: A risk factor for aortic distortion in patients considered for percutaneous pulmonary valve implantation?